AntiVirus 2008 displays security warnings similar to Windows like warning message with a link to a web site http://rapidantivirus.com. 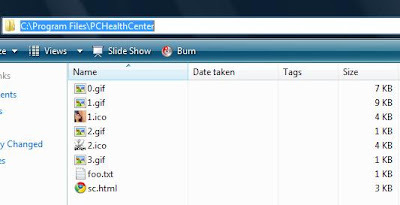 Executable files of this misleading application is stored under this path "C:\Program Files\PCHealthCenter". This folder contains these files ..
Security Center helps you manage your Windows security settings. To help protect your computer, make sure all the security essentials below are marked ON. If the settings are not ON, follow the recommendations. Windows did not find antivirus software on this computer. 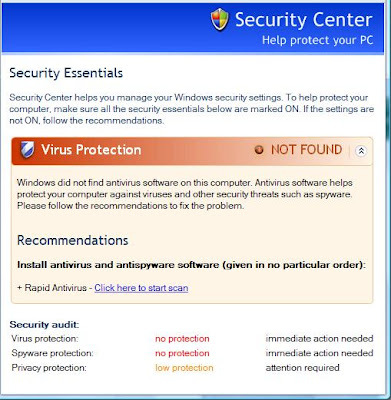 Antivirus software helps protect your computer against viruses and other security threats such as spyware. Please follow the recommendations to fix the problem. How to remove "autorun.inf" from USB Drive ?